Joints, as seen in Figure 1, are planar geological structures across which displacement discontinuities are predominantly normal to the plane of the structure; that is, the two surfaces defining the structure have moved away from each other in a direction predominantly perpendicular to the surfaces (see Figure 1 of Fractures for a schematic diagram illustrating the kinematics). Joints are sometimes called dilating fractures, opening fractures, extension fractures, cracks, and fissures (Pollard and Aydin, 1988). Joints are also named according to their relationships to each other and to other structures. Examples of this type of terminology include en echelon joints, composite joints, splay joints, and cross joints. En echelon or simply echelon joints are joints broken up into segments with sub-parallel arrangement. Composite joints are characterized by many segments slightly offset across planar anisotropies or inhomogeneities in rocks, for example, bed interfaces. Splay joints are associated with shearing of an earlier discontinuity and branching of an earlier fracture. 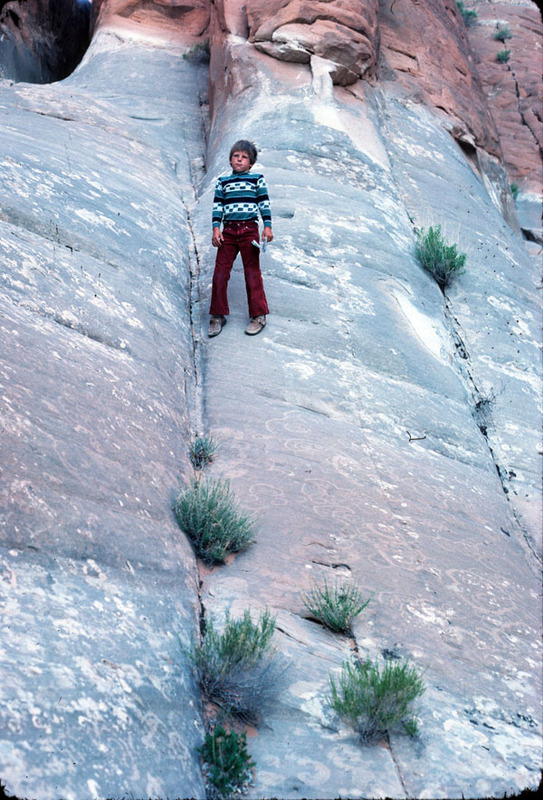 Cross joints or cross strike joints (Engelder and Geiser, 1980) refer to those joints perpendicular to the structural grain generally in fold and thrust belts. With respect to bedding, joints may be referred to as bed-parallel and bed-perpendicular (see also Joint Orientation). Figure 1. Joint traces exposed at a steep erosional surface of the Jurassic Entrada Sandstone northwest of the Devil's Garden parking lot area, Arches National Park, Utah. Please see Dyer (1983) and Cruikshank and Aydin (1995) for the details of the joints at the park. When joints are wholly or partially filled with hydrothermal minerals, they are called veins (Figure 2 and Figure 3). Fluids that pass through fractures, especially at high temperatures and with large enough pressure drop, can deposit minerals that fill the fractures and form veins, the thicknesses of which are a measure of the opening during the precipitation. 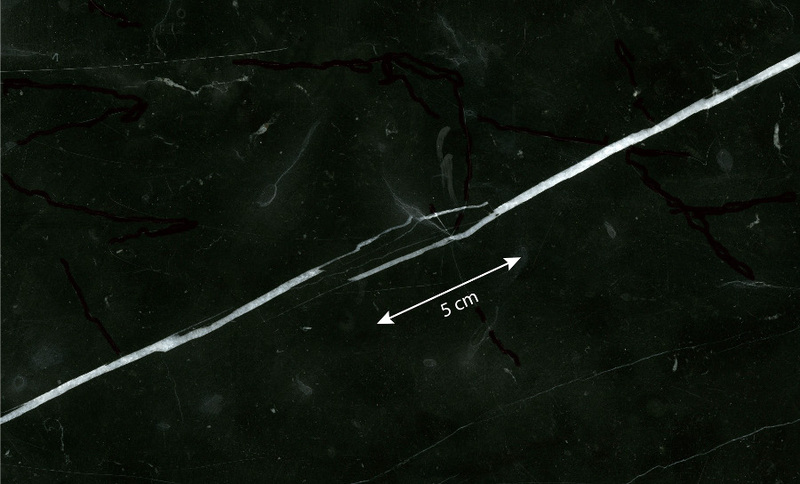 The aperture of the initial fracture and the aperture during the precipitation are different as indicated by various thicknesses ranging from hairline to as much as 3.5 mm in Figure 3. Similarly, dikes filled by magma solidified later represent the same type of structure, often at larger scale. Figure 2. 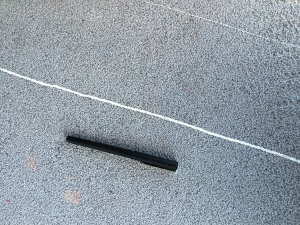 Traces of two parallel veins with different thicknesses of their in-fillings as seen on a cut and polished surface of a building stone in northern Spain. Pen for scale. Figure 3. 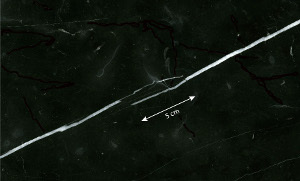 Calcite veins (white) in a cut and polished surface of a tile of black marble building stone from Italy. The thicknesses of the veins vary from hairline to about 3.5 mm. Two segments of the veins overlap for about 5 cm, which, together with large thickness variation, reveals multi-stage opening history. Sample courtesy of Isik Aydinli. Joints may also be classified based on their geneses, such as tectonic joints, cooling (thermal) and desiccation joints, exfoliation joints, and releasing joints, etc. Joint surfaces are commonly decorated by plumose structures to be described in the section titled 'Physical Properties of Joints' and 'Joint Surface Morphology-Plumose Structure.' There is a discipline of science called fractography that deals with fracture surface features (Kulander et al., 1979; Bahat et al., 2005). Bahat, D., Rabinovitch, A., Vladimir, F., 2005. Tensile Fracturing In Rocks: Tectonofractographic And Electromagnetic Radiation Methods. Springer, 569p. Cruikshank, K.M., Aydin, A., 1995. Unweaving the joints in Entrada Sandstone, Arches National Park, Utah, U.S.A.. Journal of Structural Geology 17: 409-421. Dyer, J.R., 1983. Jointing in sandstones, Arches National Park, Utah. Ph. D. Dissertation, Stanford University, 202 p.
Engelder, T., Geiser, P.A., 1980. On the use of regional joint sets as trajectories of Paleostress fields during the development of Appalachian Plateau, New York. Journal of Geophysical Research 85 (B11): 6319-6341. Kulander, B.R., Dean, S.L., Barton, C.C., 1979. The application of fractography to core and outcrop investigations. Technical Report for the U.S. Department of Energy, METC/SP-79/3, pp 174. Pollard, D.D., Aydin, A., 1988. Progress in understanding jointing over the past century. Geological Society of America Bulletin 100 (8): 1181-1204.